Everybody knows that dogs are a human’s best friend. Whether they’re melting our hearts by excitedly greeting us when we get home (usually as if they thought we’d probably never come back), actively making us healthier, or just being our BFFs for life, the dog-human bond is simply the best. 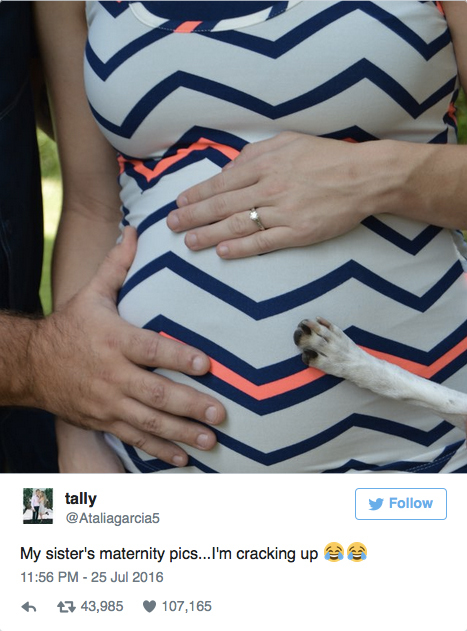 But in a couple’s now-viral pregnancy announcement photo, one family pup is really taking things to the next level. The backstory, courtesy of Buzzfeed: Whitney Bowie and her husband Jeremy, a couple from southeast Texas, added a beautiful baby boy to their family on July 27th. His name is Raylan Gregg Bowie, and lucky for baby Raylan, he’s already got an automatic best pal in the form of his parents’ dog Lucy. Lucy, a rat terrier, is so attached to her pair of humans that she just had to join in when she saw the couple posing for their maternity pics. In one photo, Whitney and Jeremy are both resting their hands on Whitney’s baby bump – and Lucy rests her paw right there alongside them. LOL! Whitney’s younger sister Atalia thought the photo was hilarious (because it totally is) and shared it with her followers via Twitter. Unexpectedly, the photo took off and went viral almost immediately. At last count, Atalia’s tweet had over 43,000 retweets and over 107,000 likes. Whoa. I guess people can really relate to the dogs-are-family-members-too thing. That, and the visual of Lucy’s tiny little paw on Whitney’s baby belly is just hilarious on its own. Take a look at the best celebrity pregnancy announcement pictures for more iconic baby bump snaps. So adorable! The first few days with a new baby can be challenging, but luckily, the Bowies have plenty of hilarious comments on and reactions to Atalia’s tweet to sift through and chuckle at. ‘We really enjoyed reading all of the comments, and watching the picture reach thousands of people all over the world,’ Whitney told Buzzfeed News. Congrats to the Bowies on their brand-new bundle of joy and having an internet-famous one-of-a-kind pup like Lucy!